Do you talk in your sleep? Maybe, but now you can find out! 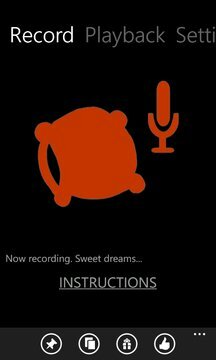 Sleep Recorder uses microphone to capture audio and saves the recording if there is any voice. It won't record silence or noise. Some people talk occasionally, some every night. Are you afraid of revealing deep secrets? Or are you missing brilliant ideas and solutions you dream about? Or are you just looking for rock solid evidence that your husband/wife/partner snores? - Upload a link of the recording to the cloud and share with friends and family! - Get quality recordings by placing your phone close to your bed. - Application runs under the lock screen. - Enjoy, share and have fun with your sleep talks! "Cute app I share a room with my two year old I downloaded it to hear her talking in her sleep turns out when she does I usually respond lol its a fun app." "Really cool! I found out I laugh in my sleep." Since it does audio capturing whole night the process is battery consuming. It consumes 30-40% of the battery for a night. Therefore we suggest you to plug-in the charger while recording. The closer the phone to you the better sound quality you will get.The application runs under the lock screen so just start recording and leave the phone as it is. Sweet dreams and speak freely while sleeping. :) Note: Location information is not shared anywhere. It is just used to map.